Are You Looking For Advertising Giveaways For St. Patrick’s Day? Comments Off on Are You Looking For Advertising Giveaways For St. Patrick’s Day? Celebrate St. Patrick’s Day With Promotional Shamrock Coasters: St. Patrick’s Day is Thursday March 17th this year and so it’s time to get your advertising green promotional products ready for the popular Irish holiday. Restaurants, Bars and Pubs will be slammed with customers on this special one day of the year! Customers love to participate in the advertising Irish holiday by wearing green and going out and drinking beer at their local pubs, bars etc.! What better time to promote your company, bar or pub name than on the popular St. Patty’s Day holiday. Handing out a free gift to everyone that stops in will be a sure remembrance of your business the next year. 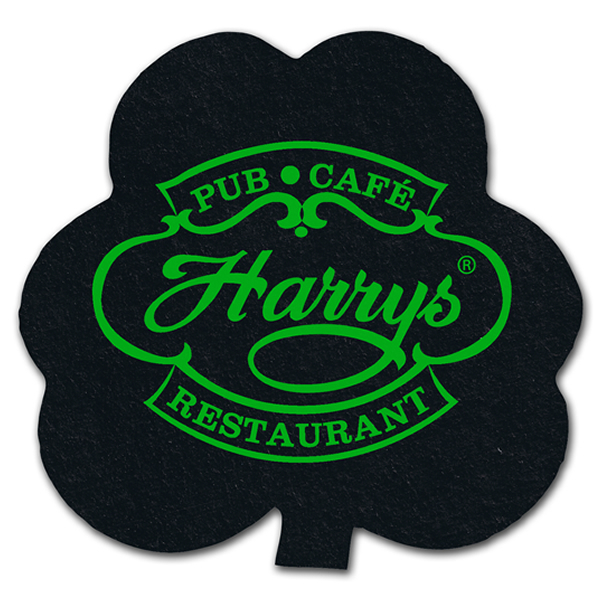 We have perfect customized medium shamrock coasters that are made from 100% recycled tire that all pubs, bars and restaurants like to use anyway, they’ll be great for adding your name and color logo to make a free marketing idea for your business. Customers will get a colorful free shamrock coaster to take home for future use. Everybody has a little bit of Irish in them on the 17th of March! We all can celebrate and pass out a bulk of advertising shamrock gifts from The Executive Advertising! If you would like other St. Patty’s Day gift ideas, we have other fantastic holiday marketing ideas for your logo. Get the party started with our promotional green t-shirts, logo shamrock hand clappers, custom shamrock billboard sunglasses and of course branded shot glasses plus so many more fun options that you don’t want to miss out on! You’ll find that our personalized St. Patrick’s Day choices are at a low cost for your marketing on a budget. So get your custom logo and choose your St. Patty promos and we’ll get your items to you quickly! We have your green promos ready when you don’t! Just let us know what Green/St. Patty’s Day ideas you like best! Happy St. Patrick’s Day Everyone! Previous postTime To Think Basketball Themed Promos For March Madness 2016! Next postWhich Promotional Water Bottle Is The Right Choice For Your Name? The Power Of Our Custom Pink Products Are Ready! Promotional Student Products For The New School Year! The Executive Advertising Marketing Ideas Blog Copyright © 2014.